On Saturday I was the lead control for the East Asia region in Megagame Makers largest ever megagame Watch the Skies: Global Conspiracy. You can read rather a lot about it on twitter, facebook, reddit and a number of blogs because there were over 300 people involved in this megagame. Look for #WTS2 to find some of it. So my role started some time ago, the first Watch the Skies megagame, with a mere 50 players, was filmed by the chaps at Shut Up & Sit DownÂ and megagames became insanely popular. I missed WTS because of family commitments (it was my daughter’s birthday weekend). WTS2, and just about every other megagame, got booked up overnight and I couldn’t get a space on it. 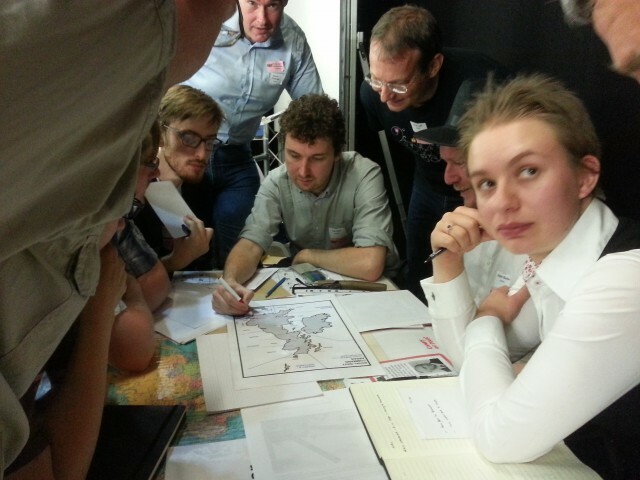 Jim Wallman had a plan though, and it involved me (and every other veteran megagame control team person). He scaled it up, to six times the size and about 25% bigger than the previous record holder for the largest ever megagame (which I played in). Jim sent the control team the draft rules for us to read and comment on. He ran tryout sessions so we could get our heads round it all. He also spent an awful lot of time organising everything. The scale of the event is just huge, and it was all done by volunteers for the love of running large games. As mentioned above, I was lead control for East Asia, there were three of us in the region looking after six human player teams plus some visitors (a mixture of aliens, press and foreign militaries). The other two control were also very experienced, and we quickly sorted out how we were going to run our corner. Mainly my job was running the map, with Andre sitting opposite while Stephen fielded all the other questions we were getting from the players not involved in whatever was going on at the map. I’m not going to give a blow by blow account, for a start I was too busy to catch anything that wasn’t at my map, and for a second I’ll let the players tell their own stories. However I do have some highlights from the notes I made for the end of game de-brief. AIM (our pet corporation) did deals very early on with China, Japan and Australia to upgrade their infrastructure and also build additional manufacturing lines there. Vietnam also benefited hugely too (the most in percentage terms). The Australians attempted to breach the Nuclear Non-Proliferation Treaty by buying nukes from Iran. This backfired spectacularly and the Australian Government sacked the Chief of the Defence Staff for unauthorised unilateral action (a likely story, but I had fun with the cabinet meeting). Korea was interesting. The South Koreans made wooing North Korea their main effort. We made it as hard as possible for that to succeed without looking like we were being mean. Their dogged determination was eventually fruitful and by the end of the game they were discussing reunification talks having signed a peace treaty two years into the game. Japan clearly had secret deals going with the aliens, although I was only aware of this because of the way they behaved. They stopped whaling and also stopped intercepting UFOs with their SIFs. This didn’t stop another group of aliens from destroying Tokyo by bombarding it with plasma from low orbit almost at the end of the game. Indonesia fell apart, it was small and poor, lost a SIF early on and seemed to be the focus for alien attention (they built a base there). When the government eventually lost the confidence of its supporters it triggered a civil war with the alien intervention splintering their armed forces. This was rapidly won by an international coalition that supported the new government. The Australian SIF teams were spectacularly successful, some of this was luck and some the judicious upgrades of their SIFs (there were four or five of these most of the time). Most turns they had two or three successes, this kept their PR track maxed out, which meant they had the money to invest in more stuff. As always it took us a couple of turns to get our heads around how best to run the map, but seeing as the players have exactly the same problem this is usually managable and so it was this time. We managed to evolve a system that worked for us and helped us get through dozen UFO interceptions in the later turns. SIF & unit upgrades need a better mechanism, there needs to be a token exchange that allows regional map controls to upgrade units with the confidence that the corporate players have actually paid to produce the upgrade. ditto a track on which science benefits have been used on keeping the terror track down. I largely relied on memory but this could have been a visual so that the players could see it. If you were there, then leave me a comment with your story, or link to your blog post, write up, twitter or whatever. Edit 2: A couple more, and there are also some in the comments. Views from the guys at Rollin Dice who were on different teams.